The historical roots of the Israeli-Palestinian conflict go back thousands of years, but are usually measured by the amount of time that has elapsed since the foundation of modern Israel roughly 70 years ago. But what about before 1948? The following tells the story of the 70 years prior to the formation of the state of Israel. For more on the historical roots of the conflict, check out Episode 1. A small group of European Jews founded the first modern Zionist settlement in Palestine, then part of the Ottoman Empire. They call it, Petah Tikva—“gateway of hope”—a hopeful name for what was more or less a stretch of swampland. Malaria quickly spread, forcing the settlers to flee. Some returned to reclaim the settlement in 1883. Later, funds donated by Edmond de Rothschild allowed settlers to drain the swamp. Settlers drain swampland around Petah Tikva, 1906. For three days in Basel, Switzerland, 208 delegates from countries all over Europe convened to debate and discuss the future of Zionism. They came at the behest of Theodor Herzl, “the father of Zionism,” who wrote in his diary: “Were I to sum up the Basel Congress in a word—which I shall guard against pronouncing publicly it would be this: At Basel, I founded the Jewish State.” The delegates approved a set of explicit goals for the movement, known as the Basel Program. These include promoting settlements, lobbying European governments, and strengthening the national consciousness of European Jews. 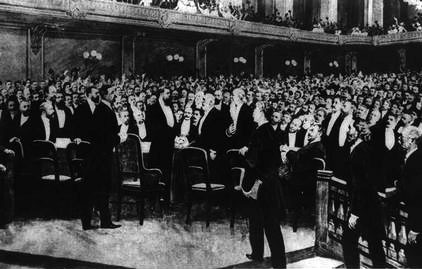 Delegates at the inaugural Zionist Congress in Basil, Switzerland, 1897. In 1914, Austrian Archduke Franz Ferdinand was assassinated by a Serbian nationalist, sparking a chain of events that would plunge imperialist Europe—and by extension, the world—into war. As soon as Britain declared war on the Ottoman Empire, the British War Cabinet began plotting the future of Palestine. The British hoped to enlist Jews in their fight against the Ottomans. British officials and Zionists, including Mark Sykes, conferenced throughout 1917 to formulate the terms of the declaration, which would be the first public expression of support for Zionism by a major world power. No Palestinian Arabs were consulted, an oversight the British later acknowledged in 1939. The declaration is considered a foundational moment for the Israeli-Palestinian conflict, as it set into motion political forces that would lead to the foundation of a Jewish state later in the century. The original text of the declaration in a letter from Foreign Secretary Arthur Balfour to Baron Edmond de Rothschild. The end of the First World War brought the collapse of the Ottoman Empire, and in its place, the British set up a civil government in Palestine sanctioned by the League of Nations. In accordance with the Balfour Declaration, the British opened the territory to Jewish migration, which swelled in the ensuing decades. But if the Mandate satisfied Zionists, it betrayed Arab Palestinians, who had fought fiercely against the Ottomans on the condition that the British would grant them their sovereignty at war's end. As more and more Jews settled the territory, relations between the two populations grew increasingly tense. The late 1920s were punctuated by two major massacres of Jewish communities by Palestinian mobs—Hebron and Tzfat In the late 1930s, anger at the British betrayal turned to revolt as Palestinians rose up against the civil government. The decades after World War One marked a period of huge Jewish migration into Palestine. What to call this period depends, principally, on whose side you are on. In Hebrew, it's known as the War of Independence (Milkhemet HaShikhrur). In Arabic, it's the Nakba or Catastrophe. In response to Arab unrest in the 1930s, the British government set up a commission to figure out what to do with the Mandate of Palestine. That commission, headed by Lord Peel, recommended a two-state solution—one Jewish, one Arab. This solution, known as partition, was thought impractical and rejected. But before further alternatives could be devised, Hitler invaded Poland. It wasn't until war's end six years later that the British took up the "Palestinian Question" once more, deciding in 1947 that they would end the Mandate of Palestine. That year, the newly-created U.N. considered a resolution that would partition Palestine into two states. Zionists generally supported the resolution, while Arabs roundly opposed it. On November 30, 1947, the United Nations vote passed in support of the partition plan. Civil war broke out across the region, forcing thousands of refugees to migrate. Then, in 1948, Israel declared independence. In response, neighboring Arab states, seeking to block the partition and protect Arab refugees, invaded the fledgling country. The 1948 Arab-Israeli war was brief but fierce. Roughly 10,000 Palestinian and 6,000 Israeli soldiers and civilians perished in the fighting. By war's end, Israel occupied 60% more land than was originally granted it by the 1947 partition plan. Roughly 750,000 Palestinians fled or were forced from their homes and villages during the war, out of a pre-war population of 1.2 million. Palestinian refugees settled in camps spread across the Arab world, many of which remain today. About 10,000 Jews had to leave their homes, but the Jewish population of Israeli grew by about 700,000 in the years immediately following the war. Most of the emigrants were refugees themselves, fleeing from Europe. The 1947 U.N. partition plan whose passing led to the Palestine War, Israeli Independence, and the 1948 Arab-Israeli War. David Ben-Gurion, who engineered the founding of Israel and was its first Prime Minister, declaring independence beneath a portrait of Theodor Hertzl, the father of Zionism.